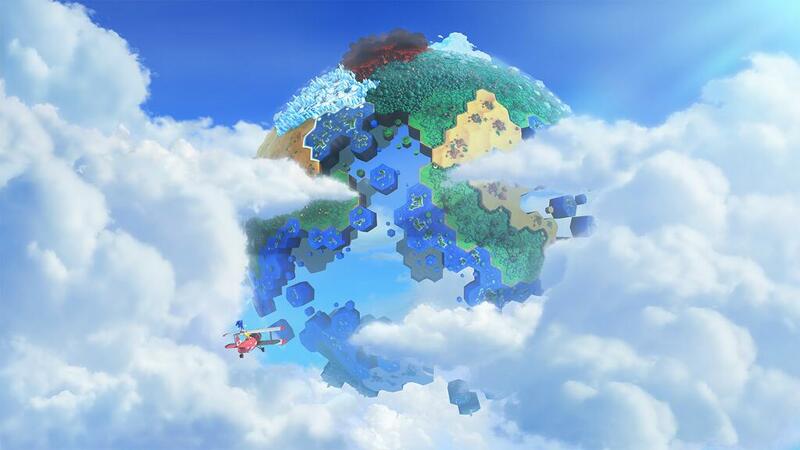 According to a couple of our readers, the official Sonic Facebook page leaked the Sonic Lost World announcement early this morning, including three images and the promise of more details May 29th. One of the images sounds like the above one released this afternoon, while another is said to have featured the outline of six ‘guardians’ from the game who may be friends or foes. What gives these details some credibility is that both readers say the leaked post mentioned the SEGA and Nintendo partnership for the next three Sonic games BEFORE it was even announced this afternoon. You can read the 2 comments after the jump. Thanks to M.S. and Bark the Polar Bear for the info. If you saw the images and managed to grab them before they were removed, please send us a news tip at news@sonicstadium.org. 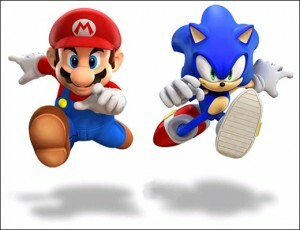 Rumour: New Sonic Spinball Game Coming To Wii? UK online retailer Simply Games are listing a new Sonic The Hedgehog Spinball title for Nintendo Wii, but what’s odd about it is they list Capcom rather than SEGA as publisher. This fresh listing has conveniently come in at a time when SEGA and Alton Towers have teamed up for a new Sonic Spinball theme park ride. A statement below from a staff member at the park claims SEGA are planning a Sonic relaunch of some kind. 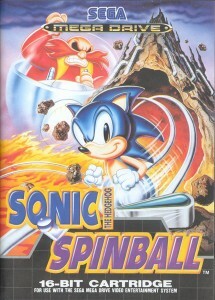 So, could SEGA be planning a relaunch for Sonic Spinball on Wii? We’ll let you know if any more info comes in, but for now take this with a grain of salt, especially as retailers make mistakes with their listings all the time. The SSMB Forums have brought to light a discussion that has recently taken place on popular imageboard 4chan. In it, an anonymous tipster called “Wentos the Travelling Salesman” has hinted at details that could be included in the next major Sonic title. Click the image on the left there to give it a good read. ‘Sonic Proof’: Prototype? Fact? Fiction? 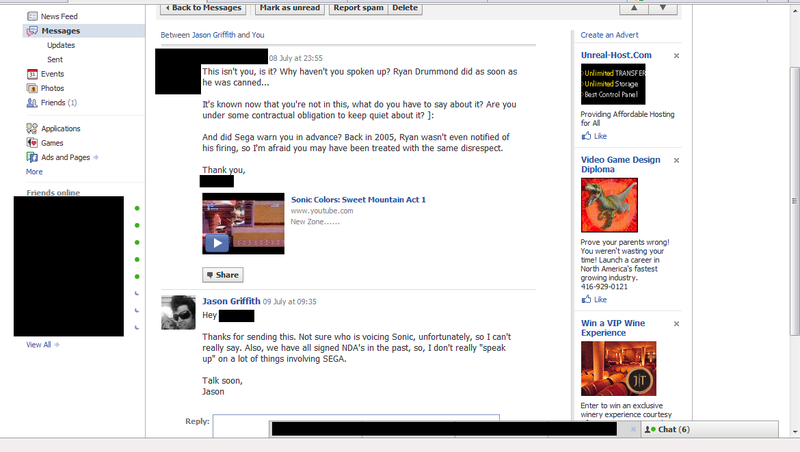 Despite no efforts to the contrary, we are still able to obtain access to Sonic Retro, including their forum. 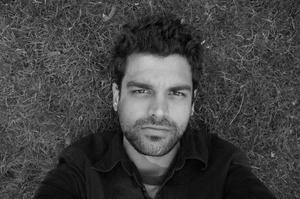 It was there that a photo was discovered that featured a disc titled ‘Sonic Proof’. To put it into some context, this disc was apparently found in a room at Sega’s Headquarters which contains almost all of their work, including Dreamcast, Saturn and Mega Drive titles. The photo above shows (an obvious CD-R based) Sonic Proof wedged between some retail games. But what does it all mean? Is it the working title for an old Sonic the Hedgehog engine? 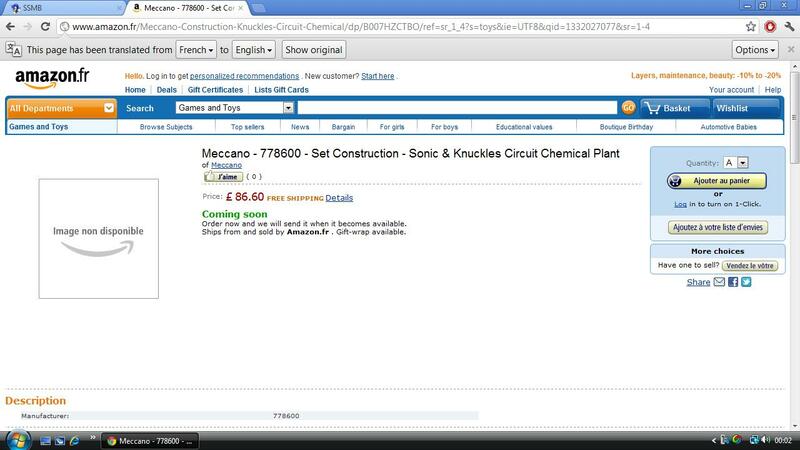 Is it a concept of another unreleased Sonic title altogether? 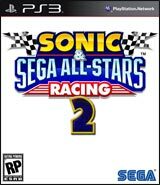 Is it something unrelated to Sonic and even Sega (the ‘Sega room’ contained games from other publishers on PS2 as well)? Is it a massive hoax or a plant (although given the original photo is pretty legit, it might not be the case)? Who the heck knows? Not many at the moment, with speculation at a dead end pretty much. We’re slapping this up as a rumour for now; Sonic Retro are pretty cool with getting information on old stuff, but until it’s verified it could well be a wild goose chase. A rating for a Sonic game has appeared on the OFLC’s website. 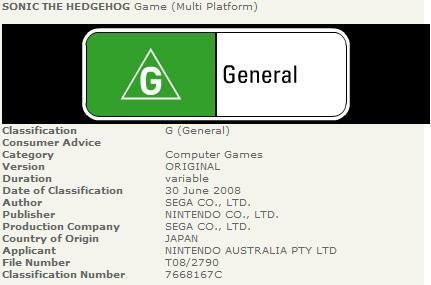 The game has been rated G for General and is simply titled “SONIC THE HEDGEHOG Game (Multi Platform)”. What’s odd about it is that the game’s publisher is listed as Nintendo. I guess this could be for Sonic Unleashed or Sonic and the Black Knight but Black Knight is supposed to be Wii Exclusive not multi-platform and Sonic Unleashed is surely being published by Sega because its being released on Sony and Microsoft platforms. Only conclusion one can come to is this must be referring to a new Wii and DS game as Nintendo are publishing it. Hopefully Nintendo/Sega will explain soon. Thanks to Dan Hibiki for bringing this to everyones attention at the SSMB! Someone’s been dreaming on the Internets again. According to an apparent lineup at PlayStation Beyond, SEGA America are set to show a game called ‘Sonic Attitude’ at E3 2008 in a few weeks time. Set as a “Rumour” (probably to save their skin when people realise it’s likely just a wishlist for said website – we’d all like an F-Zero for Wii and a NSMB2 for DS), this Sonic game we’ve never heard of will apparently be on the Nintendo DS and is 100% more important than Sonic Chronicles, which isn’t set to make an appearance at all. No sources are given, and E3 doesn’t seem to have an official list of attendees, at least right now. And unless Dimps really enjoy overworking, pain and suffering (the team is currently responsible for the PS2 and Wii versions of Sonic Unleashed) they won’t be undertaking a new Sonic project either. This is either Sonic Chronicles in sheep’s clothing or I’m eating someone’s clean, plush hat. Sonic Unleashed coming to four platforms? According to GameStop, Sonic Unleashed will be coming to the Wii, PS2, Xbox 360, and PS3 on November 4th, 2008. The prices vary from SKU to SKU, but the PS2 version will be selling for the budget price of $30, while the Wii and PS3/360 versions will be going for the standard $50/$60 price tag respectivey. GameStop can often be a source for new info on upcoming games, with prices, release dates, names, and platforms for upcoming games often leaked months before the publisher officially announces the info. They where the ones who leaked Samba De Amigo Wii early, among other games. While their track record is very solid, any info from them should still be regarded as speculation and rumor, until officially confirmed by SEGA. 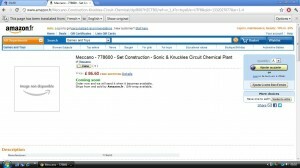 Sega working on “real” Sonic game? Well everyone, I’ve just gotten home from GameStop, and I have some fine news for fans of Sonic Team’s critically acclaimed Dreamcast game “Samba De Amigo”. GameStop has the game listed for the Wii, with a release date of Febuary 6th, 2008 at an MSRP of $50. The game was simply listed as “Samba De Amigo”, without any numbers or subtitles in the name, so it’s unknown whether this game is a sequel or a remake of the Dreamcast games. Before commenting, please read the article thoroughly, as there have been some misunderstandings. A Spanish interview with Smash Bros. Brawl director Masahiro Sakurai reveals that Sonic the Hedgehog is already present in the Nintendo fighting game, and awaits SEGA’s approval before implementing him into the final product. The interview, initially posted by Shakidna on Sonic CulT forums and then translated by ICEknight of The GHZ, is the first real confirmation of Sonic’s existence in the game, and is no doubt news to get many fans excited. Sonic The Hedgehog Movie In Pre-Production? Rumours have been flying around the Internet for years now about a Sonic The Hedgehog motion picture, however, one of these trails it seems may finally come into fruition. Film maker Richard Kuta has been working on an animated film based on the series known commonly to fans as Sonic SatAM, and has recently received approval for the project from Soloakai Animation. After successful negotiations with SEGA throughout last year, Kuta and his co-writer initially pitched the film to IDT Entertainment, who mulled over the idea before eventually rejecting it. Since then the team proposed the film to Solokai Animation, who were more than happy to take the project onboard. Continue reading Sonic The Hedgehog Movie In Pre-Production? Yuji Naka to leave SEGA? Just minutes ago news has broken (VIA a next-gen.biz update) that Yuji Naka, head of Sonic Team throughout the Sonic the Hedgehog series, is planning to leave SEGA/Sonic Team shortly. Details are uncertain at this point, however it is understood Naka will be forming new game development studio, which according to rumours, will still be in alliance with SEGA. 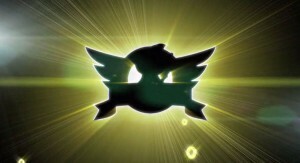 Further details are still yet to be revealed, but stay with SONIC NEWS to find out as it breaks.